If further proof is needed that copyright trolls are only interested in money and couldn't care less about artists or their reputations, read on. A lawsuit, filed against fans of the band All Shall Perish, caused chaos in the past 48 hours when the horrified band revealed they know nothing about it. Speaking with TorrentFreak, the band's manager says they are "gutted" by the news and have no idea what is going on. As reported here on Friday, a lawsuit filed April 20th in the US District Court For The Middle District of Florida is targeting fans of American metal band All Shall Perish. Up to a point it’s a familiar story. A total of 80 IP addresses are listed having been harvested from a BitTorrent swarm sharing the album “This Is Where It Ends”. The plaintiff, a company called World Digital Rights, wants to discover the real-life identities of the alleged file-sharers so they can be hauled into court or, as is almost guaranteed, settled with for a few thousand dollars instead. After the news broke, predictably the band started to receive negative feedback. 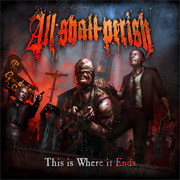 But according to All Shall Perish’s manager, Ryan Downey, neither he nor the band know anything about the legal action. In reality the answer seems more straightforward. All Shall Perish’s German label are Nuclear Blast who according to their site are “the largest independent heavy metal label in the world.” Even if Nuclear Blast’s president is confused by the lawsuit, people working for him are definitely fully in the picture. According to the lawsuit, on March 12, 2012, Nuclear Blast signed over the rights to “This Is Where It Ends” to World Digital Rights, Inc., an act that made the Panama-based company the “exclusive licensee” of the album. Along with that came the right to sue and it seems the company are now making the most of that right. After conducting another search of court documents today, it appears that World Digital Rights actually filed two lawsuits against alleged sharers of the album, one against 80 Does and another against a further 100. In both cases World Digital Rights demands that each defendant is held “jointly and severally liable for the direct infringement of each other defendant” and held liable for statutory damages of $150,000.